The kids have spoken, the designer has drawn, and plans are getting underway to build a new playground next to the incoming splash pad at Stryker Park. If all goes as planned, the new handicapped accessible, state-of-the art structure will feature a treehouse, a zip line, and musical instruments. Plans also call for the composite structure to include a fire station, technology area, and a component that pays homage to local history. 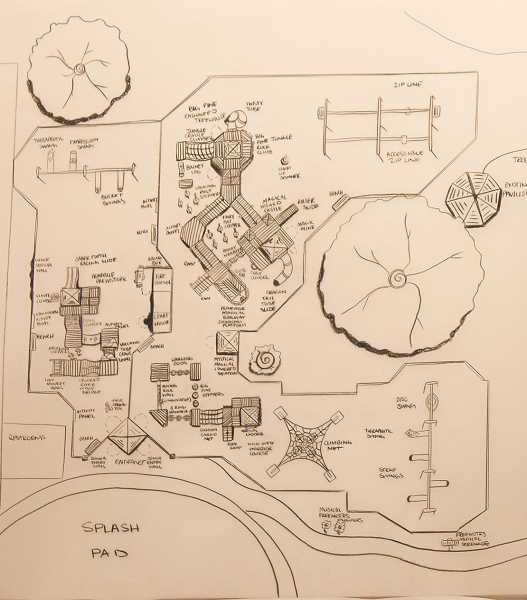 "The kids wanted a Harry Potter kind of theme, so we got something like that in there with a castle and a dragon and a train," said Crook County Parks and Recreation Foundation Board Chair Linda Haden, who is spearheading the project. "It's going to be so cool." "We don't actually know yet what the cost will be," said Crook County Parks and Recreation District Executive Director Duane Garner. "We should know more in a couple weeks." Haden hopes to be able to secure in-kind donations and grants. Fundraising ideas are underway, including Buy a Picket. "The fence will go all the way around the park. It will only have one way in. We're going to start selling pickets with your name on it, so it'll be a part of the playground," Haden said. Danielle Campbell, a designer from Playgrounds by Leathers in New York, visited Prineville early last week to see the site and get ideas from the community. She talked to some Barnes Butte Elementary students on Design Day, Sept. 11, where she found out just what they wanted in a play structure. She then spent the afternoon creating a potential design using the kids' suggestions, and then presented it to the public that evening. "The evening went really well. We had key people come, but we didn't have a big turnout," Haden said. "It was enough people to really see what we were thinking and our dreams about a new state-of-the-art playground for the kids." However, she noted that Kiwanis Splash Park coordinator Wayne Looney and Crook County-Prineville Chamber of Commerce Executive Director Kim Daniels were there and gave their approval. "Having a state-of-the-art playground and the splash pad would make Prineville a destination for families beyond our county that are looking for a safe, fun play area for their children," Daniels said. "The playground and splash pad will also help keep locals in town, rather than having them travel to the Madras pool or Bend/Redmond parks." Looney said the proposed playground is a very forward-thinking and very attractive amenity for the community. "It would be a nice and appropriate addition to our splash park and create a central recreational area for the young people in our community that is readily accessible by foot, bike or car," he said. "It could be a real benefit to the core area of the town for people to see when they come here and maybe want to relocate or for businesses that might grow up around something that might be fed by the traffic that would be attracted to the splash park and really cool playground design." The designer will send an updated drawing in the near future. The proposal will then be presented to the city. If approved locally, it will go to FEMA for approval since the Stryker Park location is in the floodplain. Haden's goal is to have the structure completed in a year. "I'm totally excited. I know this is going to be a project to really work on, and I am gung-ho about it," she said. Meanwhile, she will be recruiting volunteers to set up various committees. "I will be at every event I can be to get people to sign up and try to get people to be team captains," she said. "It's going to take some time, but it will get done."